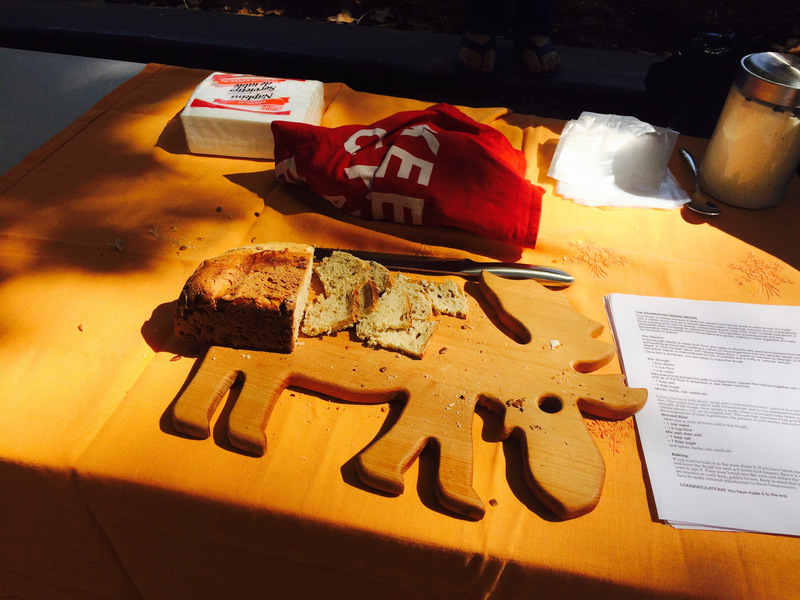 Every year for the past five years, a small event unfolds at a set of local rooms in Palo Alto, California. Tables also unfold, and chairs emerge into a hallway. Soon the tabletops bloom with small Christmas trees, ornaments, garlands, Meyer lemons, board games, blouses, card sets, and well-thumbed books. People are chatting about where things came from and how they might be used, and are catching up with old and new friends. A volunteer and resident bike expert is repairing the bikes of those who rode them in. Inside the room, someone is talking about how to make a cranberry vinaigrette or a holiday wreath, and perhaps a group has gathered to tell stories of traditions. 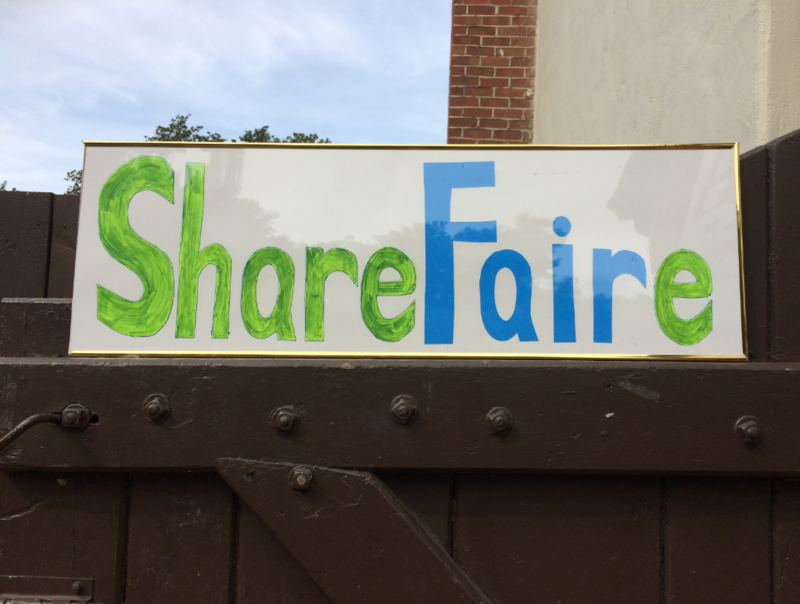 This is the Holiday Share Faire, which Transition Palo Alto has nurtured each year in the hope of reducing our dependence on fossil fuels and combating climate change, with a vision of building local resilience and creating community. We gather over the seasons to share household goods, books, toys, clothes, crafts, and garden produce, as well as our community's skills and expertise. We are trying, bit by bit, to bring the essence of community and a sense of abundance to this increasingly consumer-driven season. Instead of buying things for our friends and family, we are sharing the things languishing in our homes. Instead of purchasing goods, we are learning how to make them. Instead of visiting the grocery store or nursery, we're sharing the bounty of our gardens and pantries. We're remembering our past, and those of others. We are sharing more than just goods—we're sharing stories, and bits of ourselves. "We are trying, bit by bit, to bring the essence of community and a sense of abundance to this increasingly consumer-driven season." The story of this event didn't come easily—we began separately with a Craft Swap and a Garden Share, and over the years the two combined into a single event. Some years, only a sparse few have attended, as other events have overlapped with our chosen date. But we use the sparsity as space to connect more deeply with those who have become friends. Sometimes we have a plethora of children eager for a fun activity, and we embrace that energy. We have neighbors who drop by—some wanting to fill bags with gifts, others who want only to learn, and still others who come only to leave things to share. Whatever their reasons, they are here to participate in this community. Over the years, our Share Faires have spanned the seasons. We've done them in spring in the rain and in summer in the park. We've held a spooky Halloween costume swap, as well as these Holiday Faires. 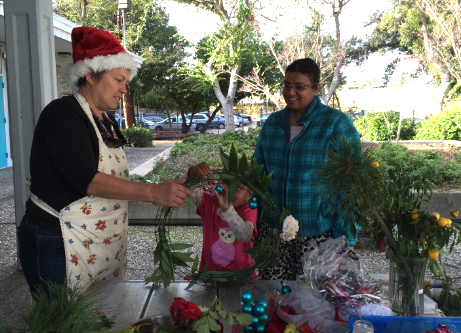 A lesson in wreath making at the Palo Alto Share Faire. Our skillshares, as we call them, have included: wreath making; holiday recipes; making cosmetics, soaps, and cleaning supplies; fermentation; bike repair and ergonomics; gardening, seed saving, and composting; storytelling and writing poems; juggling; weaving bracelets and making jewelry; making sourdough; wrapping and flower arranging; sewing and darning; yoga and exercise; massage; computer repair; social media; wheat threshing; shoe making; caring for bees; aromatherapy; story circles; saving rainwater; knitting; scrapbooking; campaigning; and so much more. This year, we've lined up sessions on candle making, crafting holiday decorations from natural materials, discussing the best and worst gifts we've received, another holiday recipe, and composting. The results are slow but steady. We face the worry that having a place to bring old items is an excuse to buy more, that people are here only to drop off their old stuff, or that our impacts are not fast and large enough. We face the temptation of taking everything for our own homes, or of making things that may never be used. But then we see that woman who once took home a pot of succulents, and brings back a whole flat of them to share. We say hi to the child who created a recycled ornament for the family tree, chat with the man who will never have to buy compost again. These stories keep us going, year after year. "We've found that our Holiday Share Faires are very cozy because people are looking for what is rarest in these times: meaningful time spent with others." Looking to start your own Holiday Share Faire? Ideally, you'll want to hold the event somewhere out of inclement weather (rain, snow, cold) to keep your goods and neighbors dry. You might find spots that are free, or you can ask for donations. Small local businesses, or libraries and community centers, may be willing to host you under their eaves—more business for them! We began in the parking lot of a garden supply store, and it launched a beautiful partnership. Have a neighbor who knits? Is your daughter a wiz at fixing things? Do you have skills of your own? Start by teaching what you know, with simple demonstrations that you can do in a short time, and, over time, you'll meet others with other skills. Make a backup plan in case anyone drops out. Sharing a treat and a treasured recipe. 3. What "stuff" will you accept? Decide what kinds of items you'd like to have available. At first, it may be easiest to start with just holiday-related items to combat an overwhelming amount of stuff. You can later expand to include other categories. Send flyers and emails to schools and neighborhood groups, and partner with other holiday events. Advertise why you are doing it as much as how, and include people of all ages. Be sure to ask for volunteers to help you out, too, because helping is part of community. Don't plan to do it all yourself, but do have a backup plan to make sure the event still goes on even if some volunteers can't do the job. Will the folks who brought a lot of stuff take their leftovers back home afterward? Can a local shelter use some decorations? Will the thrift store take them? Can books go to a library? Plan ahead, with enough help to take things away, and your event should go smoothly. Rani Jayakumar is a member of Transition Palo Alto, where she began organizing craft swaps, and a co-founder of the Midtown Palo Alto Green Team. She is a mother and also teaches Indian classical music. She believes in the power of creative reuse and sharing in the local community to help bring about sustainability, and brings these principles to her various interests. Other interests include cooking, writing, website building, and biology.